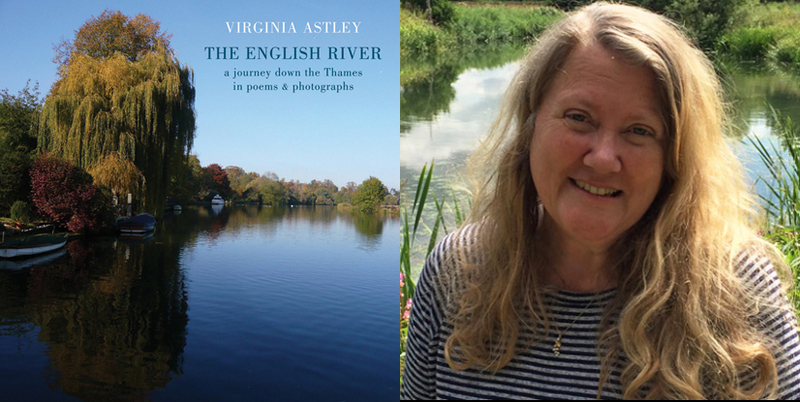 Songwriter and poet Virginia Astley’s debut poetry collection The English River: a journey down the Thames in poems & photographs, records her walk along the river from source to the Thames Barrier. Virginia launched the book at Waterstones in Dorchester, Dorset in 2018, accompanied by her daughter on harp, with further readings in London and Totnes. The book is introduced by Pete Townshend of The Who. Virginia Astley grew up by the river’s upper reaches, knew the lock-keepers and was familiar with all aspects of the Thames and its hinterland. These poems tell the story of her return to the Thames, of three years spent tracing its course and of the lives of those connected with the river, as well as her summer spent as a lock-keeper’s assistant based on the upper reach. Virginia Astley has been a much-admired singer and songwriter since the 1980s, known for her engaging lyrics as well as for her melodious style. Since the publication of her chapbook The Curative Harp in 2015, poetry has been added to the mix. In 2017 she became writer-in-residence at Thomas Hardy’s Cottage. She continues to perform, together with her daughter Florence on harp, regularly at Max Gate – Thomas Hardy’s house in Dorchester. East Coker Poetry Group meeting, The Helyar Arms, Moor Lane, East Coker, Yeovil BA22 9JR, Tuesday 28 May, 7pm. Virginia Astley was the guest on BBC 6 Music's Gideon Coe show’s Late Night Book Club on Thursday 12 July. She was speaking about The English River as well as her songwriting career, and chose some of the music played. An edited 25-minute clip from the interview is here. The English River was Book of the Month for June 2018 on Caught by the River. Poem & photograph from the book featured here. An in-depth review by Richard King is here. 'I think there’s a deep connection between song-writing and poetry. They feel like hybrid forms of the same thing.' - Virginia Astley on her debut poetry collection in an interview with Literature Works. For the full interview & review, click here.